Baking quite possibly the best cheesecakes in the universe, Junior's Restaurant is a legend in its own right. With locations in downtown Brooklyn, Times Square, and Grand Central Station in New York, this home away from home has been wooing New Yorkers since it first opened its doors on Election Day, 1950. And now, finally, the restaurant is willing to offer up the recipes that have had Brooklynites double-parking on Flatbush Avenue for generations. 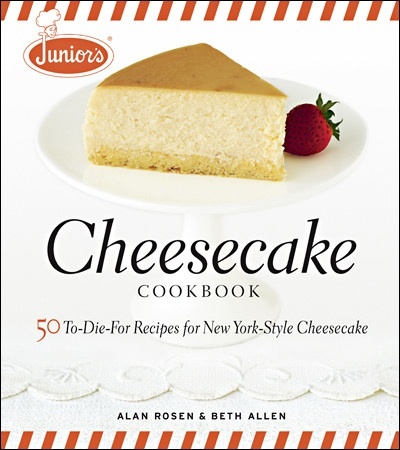 Included are 50 recipes for Junior's New York-style cheesecakes (all cream cheese, no sour cream, thank you, on a sponge-cake crust), from the cheesecake that started it all (Junior's Original New York Cheesecake) to flavor twists like Banana Fudge, Rocky Road, and Pumpkin Mousse, to little cheesecakes meant just for one (called Little Fellas), to Junior's newest creation, Skyscraper Cheesecakes (think alternating layers of cheesecake and layer cake) in flavors like Boston Cream Pie, Lemon Coconut, and Carrot Cake. It's a cheesecake lover's delight!